Description: Incredible beauty boasting 4 bedrooms, 2.5 baths, lge loft, huge family rm, fireplace, den, gorgeous kitchen with tons of upgraded maple cabs, granite, stainless appliances; open-winding 2-story staircase, second rear staircase! Fabulous hardwood floors most of 1st floor, 3 car garage, full basement, fenced yard, & nestled on an interior lot! 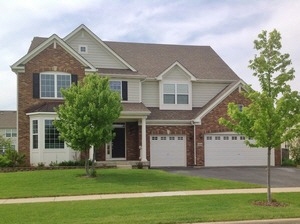 "Amazing curb appeal w/sm porch & bold columns" say a warm "welcome home!